"A subject? You dont say!" Nicolas Cage is an actor. Greece is a beautiful country. Julio, Rafael, and I went to the store. Swimming and bicycling are fun activities. Subjects usually come at the beginning of a sentence but they dont have to. A pronoun is a shorter word that takes the place of a longer noun. We use pronouns once weve introduced a noun so that we dont have to keep repeating the same thing over and over again. Here are some sentences where the subjects have been replaced with subject pronouns. The subject pronouns in English are I, you, he, she, it, we, and they. It can be beneficial to organize them into a chart based on number (how many people or things there are) and person (whether youre talking about yourself, to someone else, or about someone else). Notice that there is no distinction in English between the singular you and the plural you. While its not considered proper grammar, many people will use yall or you guys to indicate that theyre speaking to more than one person. Its also worth noting that he and she are the only pronouns that take gender into account. Note there is no subject pronoun for "it" in Spanish. How do you say "it"? See below. To say "she" in Spanish, say ella. Remember that the "ll" is pronounced like a "y." Note: If you are male, its very unlikely you would ever have reason to say or write nosotras. Usually when you need to say we in Spanish, you say nosotros. The exception is when a female is referring to herself and other females. She will say nosotras. What about a mixed group? Its not very nice or politically correct but only groups consisting entirely of females are considered feminine (nosotras). Add one male to the group and whole group is considered masculine (nosotros). We (group with one or more males) speak Spanish. We (all female group) speak Spanish. 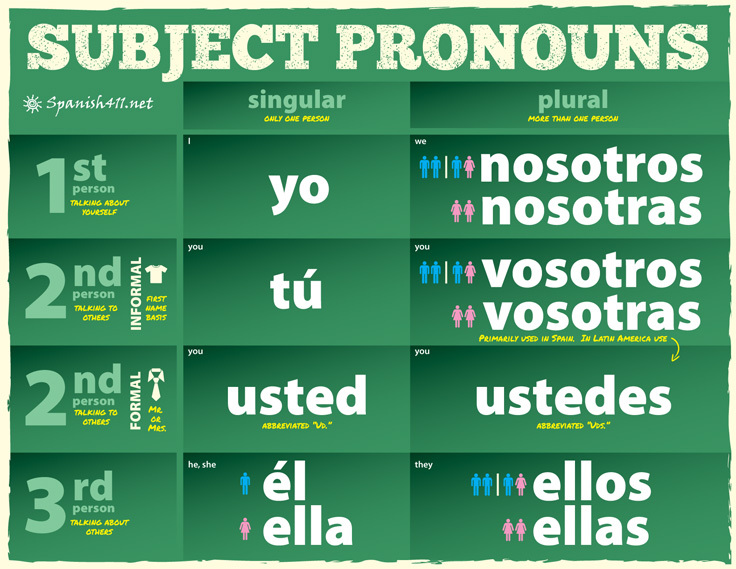 Unlike English, Spanish does have a way to distinguish between a singular you and a plural you. To address a group of people as you, use vosotros. You / Yall / You guys speak Spanish. If the entire group youre addressing is female, say vosotras instead. You (all female group) speak Spanish. Regardless of the size of the group, if it includes just one male, use vosotros. If you're ever in doubt, use the masculine form. Heres the catch, and its a big one: Vosotros is used almost exclusively in Spain. So how do you address a group of people if youre not in Spain? See Vosotros and Ustedes below. To say they in Spanish, you say either ellos or ellas. Which is which? The same gender rules you learned in nosotros apply. A group consisting entirely of females should be referred to as ellas. Any group with at least one male in it should be referred to as ellos. If you're ever in doubt, it's best to use the masculine form. They (group with one or more males) speak Spanish. They (all female group) speak Spanish. So which do you use when? A good rule of thumb to use is the first name test. If youre on a first name basis with someone, you may address them as tú. If you wouldnt address that person by their first name, you should probably use usted. Note: Theres even a verb for addressing someone as tú: tutear. Different countries have different rules for using tú vs. usted. While some people might consider your use of tú endearing, others may consider it offensive. When in doubt, use usted. Youre better off addressing someone as usted when theyre expecting tú than the other way around. The word usted is commonly abbreviated Ud. (note the capital letter). Remember, however, that vosotros is primarily used in Spain. How do you address groups of people in the rest of the Spanish-speaking world? Use ustedes regardless of the level of formality. The word ustedes is commonly abbreviated Uds. (note the capital letter). Thou may sound stuffy and formal now, but it used to be the informal version of you. Saying you was actually a sign of respect. Older translations of the Bible are full of "thou," "thee," and "thy" not because of formality, but in order to stress that God was familiar and approachable. Nowadays Spanish versions of the Bible use tú when translating references to God for the same reason. If tú vs. usted wasnt complicated enough, some regions of the Spanish-speaking world have a third category, vos. Generally speaking vos indicates an even closer relationship than tú. Read more about vos here: What is the Deal with Vos (Voseo)? Vosotros forms primarily used in Spain. Ustedes preferred in Latin America. Use feminine forms (nosotras, vosotras, ellas) if entire group is female. Otherwise, use masculine. There is no subject pronoun for "it" in Spanish.